I bought some Fuji apples a few weeks ago, and maybe I bought too many! Got to use them up and what better and delicious way than an apple pie? In this case, it's hand pies! 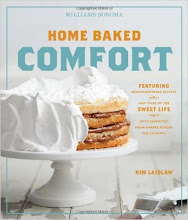 Recipe is from Home Baked Comfort by Kim Laidlaw, and so far I have had success with all the recipes I've tried. I started by making the flaky pie dough in the morning, and by late afternoon, we have warm fragrant apple pie for tea time treat. Fuji apples, it's one of my favourite apples to use for baking. The apples are peeled, cored and cut into small cubes, then mixed with some brown sugar, ground cinnamon, lemon juice and a tablespoon of flour. Once the dough is done, it is rolled out and cut out into 6 or 7 inches rounds, using a bowl as a guide. Brush some egg mixture along the border of half of each rounds. Scoop some filling and place in the centre of the round, bring the sides of the dough together and press to seal. Use a fork to press the borders. Brush the top of the dough with more egg mixture. The recipe did not say anything about slashing the top, but I made a couple of slashes, to allow steam to escape during baking. I've used a 5-1/2 inch bowl as a guide to cut out the rounds and the dough yields 9 rounds for 9 pies. Bake until golden brown, and the juices are bubbling and oozing from the slashes. Freshly baked, still warm, about to be served! Yum! The pie crust is flaky, buttery and crisp tender. Juicy soft apple filling and fragrant from the cinnamon. There's a vanilla glaze which is drizzled over the baked pies, (given in the recipe), but I have omitted the glaze. I let the baked pie rest for 10 to 15 minutes before eating. So good when eating the still warm pie, but be careful when biting into the filling, it's hot! We did not miss the glaze at all, the pie is very good even without it. With a mug of warm tea, this is the perfect afternoon snack.